Local legend William “Tiny” Naylor was the first to sell the short-order staple at his eponymous diner chain in the ’40s, but its revival is more recent. 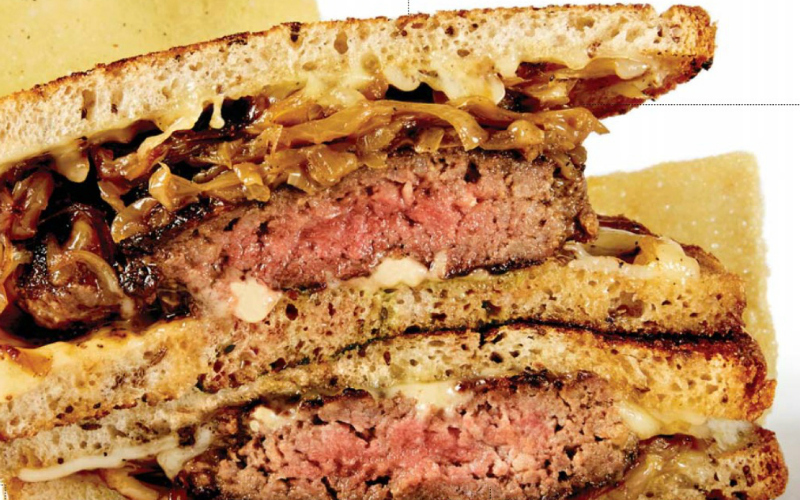 What’s the secret to such a simple burger, er, sandwich? We asked the griddle gurus redefining our city’s civic treasure. At the Standard hotel in West Hollywood, Alma’s Ari Taymor opts for Clark Street Bread sourdough instead of traditional rye. “It’s absolutely some of the best bread in the city,” he says. “The crispy exterior, soft interior, and tang work well against the richness. It supports the whole thing.” 8300 Sunset Blvd., West Hollywood. Ted Hopson of the Bellwether in Studio City channels a little bit of Italy with his melt. It comes with a side of zesty Calabrian chile aioli rather than the usual Thousand Island dressing. “When you combine it with the sweet onion compote and Taleggio cheese, it’s the perfect bite.” 13251 Ventura Blvd., Studio City. For Micah Wexler’s chopped steak sandwich (aka patty melt) at Wexler’s Deli in Century City, the chef eschews Swiss for raclette, a slightly nutty alpine cheese. “I wanted a cheese with a bit of funk that could stay oozy and melty the whole time you’re eating the sandwich.” 10250 Santa Monica Blvd., Century City. “It’s not named for the bread,” says Page. The beef patty he uses “is all about the grind, the seasoning, and how you cook it.” At Cassell’s, patties are made with a blend of chuck and brisket that’s ground in house daily and heavily seared. “The most important thing is that caramelized reaction on the outside, like a good steak.” 3600 W. Sixth St., Koreatown.